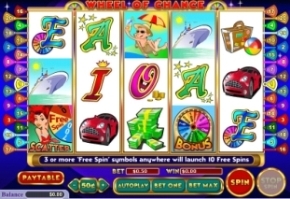 The Wheel of Chance bonus slot game is based on the popular tv show and offers two fun bonus rounds. The top prize is $160,000! When 3 or more scatter symbols stop on any of the reels a 10 free spin bonus round is triggered. Each payline win during the free spins is tripled. In addition, the scatter win can be 5, 20 or 500 times your wager depending on the number of scatter symbols that stopped on the reels. If 2 wheel bonus symbols stop anywhere on reels 2 and 4 the Wheel of Chance bonus round is trigggered. In the Wheel of Chance bonus round you spin a wheel that has been sliced with multiple prize awards and several bust symbols. If the wheel stops on a prize you have the option of accepting it or spinning again. If you decide to spin again and the wheel stops on a prize it gets added to your bonus bank and that slice along with a few others turn into bust slices. If you accept the prize you win all accumulated prizes in the bonus bank. If you spain again and land on a bust symbol you forfeit all the prizes accumulated in your bonus bank and are awarded a consolation prize of 10 times your coin wager. Best Features: Any wild symbol that completes a payline combination automatically doubles the win. The Wheel of Chance bonus round can be activated during the free spin bonus round. The WGS Casinos accept both International and USA players. USA players can deposits with credit or debit cards. 5 reels, 20 paylines, wager from 1¢ to $10 per payline.